Last year during holiday shopping season a report was released stating Black buying power would reach $1.1 trillion by 2015. About the finding the chairman of the National Newspaper Publishers Association, Cloves Campbell, said he hoped it would make businesses develop strategies inclusive of Black communities. One business model rarely inclusive of Black people is Hollywood. Movie studios aren't hostile to the Black community but they aren't very welcoming either. Enter Steve Harvey and the now number one film in the country Think Like a Man. 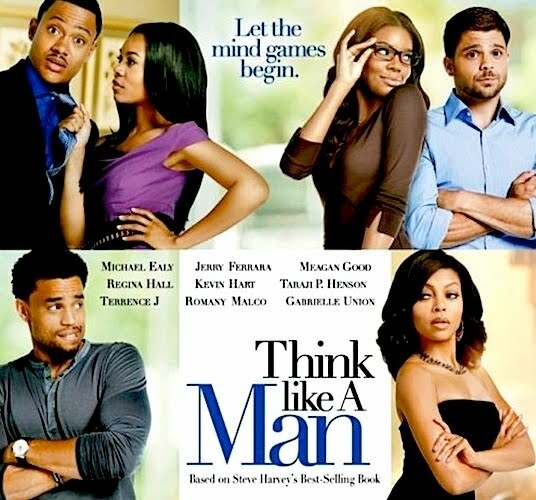 Think Like a Man dethroned Hunger Games from the number one spot after four weeks bringing in $33.6 million. Such a feat is a major accomplishment for any film, but a blockbuster for a Black film which is usually opened in fewer theaters than most mainstream movies and are rare in access as traditional Friday, date night, dinner and a movie options. So the question has been raised as with any other successful "Black" movie, "Will Hollywood now greenlight more Black films since it is clear Black folks do go to the movies and spend their money?" Pardon me to rain on anyone's parade who's thinking, "Hell Yeah Hollywood take that." A "Black" movie being successful is not foreign. Why do you think Tyler Perry is still in business? I'm very proud of Steve Harvey and the cast and crew involved in making Think Like a Man a success. However, you won't see me waiting around with bated breath for Hollywood to come to its senses and greenlight an onslaught of "Black" movies with the premise "It worked for Think Like a Man why not with this next "Black" film with an all star cast." Hollywood has a specific modus operandi. It is to make money. Lots of money. James Cameron Titanic money. Making money does not mean taking a chance on "passion projects" because one or even a handful did well. I understand Think Like a Man is not a passion project per say. However, we all know it will not come anywhere close to the sales of the coming summer blockbuster The Avengers. "But what rom-com does right?" Legitimate question. Real answer, none. In Hollywood it's about more than just sales it's about safety. Why would movie studios worry their heads about making another "Black" rom-com when Black people will just as happily go see Bridesmaids or Friends with Kids or The Five Year Engagement. If Think Like a Man inspires anything it will be copycat films. Think The Best Man, The Wood, The Brothers or Love & Basketball and Brown Sugar. I for one don't want to see Jimi Izrael's The Denzel Principle turned into a film to capitalize off the success of Steve Harvey's Act Like a Lady, Think Like a Man. I also don't want to see another film like The Help or its copycat Red Tails. Hollywood likes to reinvent the wheel because in the end the wheel is still good, it still sells, and people still need wheels. What they don't necessarily need is a specific brand of wheel. Think of "Black" films like brand name wheels. They may sell well but they are still a niche market not necessary or important enough to impact a bottom line if they don't get made. 1. Is there any way you could think Hollywood would be open to green lighting several different "Black" films to appease and appeal to the Black market. 2. Is there anything Black people can do to make Hollywood respect their wishes such as a boycott? 3. Would that even work? 4. Did you enjoy Think Like a Man (no spoilers)?